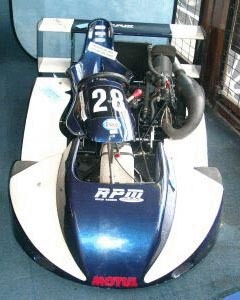 250N Gearbox Kart, Zip Eagle Chassis. Full long circuit bodywork (nose, sidepods, rear wing, high back seat, contoured undertray). Four Zip twin-pot brakes with brand new pads. Vented cross-drilled discs on all four corners. Fresh 250cc Yamaha YZ engine (5speed), only run on Red Line oil. Engine was rebored/new piston and has less than 1hours running on it so far (basically, it rips your arms off :D). Water cooled (rear radiator). Pulse fuel pump (rather than cam driven). Brake bias adjuster on steering column. Electrical cut-off on column. Comes with one set of soft slicks on rims, one set of hard slicks on rims, one set of new soft wets on rims. This is a straight, quick and well-maintained kart. It's been my own speed toy that I've used (and still do) for cheap high speed fun when time allows, fastest thing I've driven, and love it bits. It's currently geared short-circuit (125mph), a sprocket change will see 145mph and long-circuit form. Overall condition good, bodywork could do with a touch up but everything runs fine. Videos available on our site (www.fluke-motorsport.co.uk).